The West Point Association of Graduates publishes Memorial Articles in memory of deceased graduates and former cadets. Articles are published in an annual issue of TAPS and online. Our guidelines and submission forms have recently been updated. If you are planning on writing a Memorial Article for a loved one or classmate, please review our guidelines and download the revised Inventory Sheet. 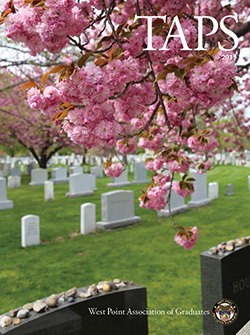 WPAOG’s Memorial Articles coordinator can offer support regarding how to research and organize a Memorial Article: for information call 845.446.1545 or email memorials@wpaog.org. You may choose to submit a draft of your own Memorial Article or provide supplementary information to assist someone preparing an article for you in the future. Make sure that you advise next of kin or classmates that you have provided this information to WPAOG. For a list of the types of supplemental information that may be submitted, please refer to the Autobiographical Data Form. Please note that images submitted which fall in this category will be returned with a request to submit a photo meeting the needed criteria. Mail-in orders: Please indicate purpose of payment (TAPS, parchment copies, or both and how many copies of each) and send payment to: West Point Association of Graduates, TAPS subscriptions, 698 Mills Road, West Point, NY 10996.